“He was honestly shocked that he was getting paid for his art,” recalls Cindy Dore Brunet of Houston, Texas. 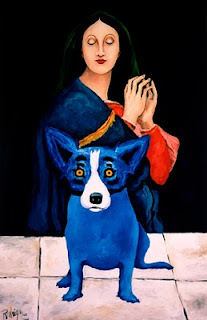 George Rodrigue arrived at her house twenty years ago in his blue van, the back lined with freshly painted mahogany Blue Dogs, carved from George's design by Douglas Shiell’s father, a master craftsman whose son assists George in numerous projects today. From his earliest Landscapes and Cajun paintings, George Rodrigue marveled that people paid him for his art. It was the Blue Dog, however, that surprised him most. Like his other series, it developed from his own artistic interests, without outside influence, and despite doubting onlookers. Is New Orleans America's most European city? I hope you enjoy and I sincerely thank you, as always, for reading. I leave you with a photograph of George Rodrigue, who found a dose of history on Royal Street in New Orleans this week at M.S. 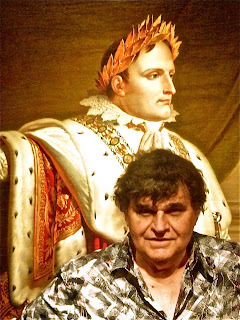 Rau Antiques, where he stumbled on Anne-Louis Girodet’s portrait of Napoleon from 1812. Thank you Cherry Ann. I will pass along the compliment. And congratulations on that sale!